We wonder if half the fun of Ramen Kan in Chinatown is getting there. Heading up to the first floor through a dodgy entry and a battered old lift feels subversive, it's so secret Sydney. Ramen Kan does a decent ramen, good broth. And the $3 side dishes are brilliant value. The joint is uber popular but somehow we've never left Ramen Kan floating on food-nerd sunshine. Salmon salad - $3. Three gulps of salmon and lots of mayo. Soft shell crab salad - $3. Mentaiko (spicy cod roe) rice ball - $3. Pickles - $1.50. The pickles are refreshing after the salty broth and go well with some rice after the ramen. Shoyu ramen - $9.90. The pork in the soup was good, well roasted. Garlic miso ramen - $11.50. This one is an instant vampire repellent, loads of hidden roast garlic to swirl around to taste. Omelette chicken rice - $11.90. Fried rice with a a few little cubes of chicken, covered with omelette with tomato sauce and mayonnaise. The side salad was great but the omuraisu was drowned in ketchup, we've had much better. Crab ankake cha-han - stone pot fried rice with salad - $12.90. Strong salty, crabby flavours, not super-wow flavours but homely and comforting. 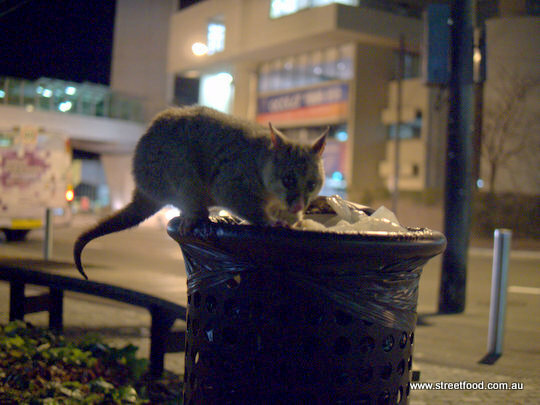 On the way home we find Mr Possum snacking in the bin outside Sydney uni. Starving students don't leave the best pickings. We advise all possums in the area to head to Victoria Park where now and again, the uber smiley chef from Golden Fang will leave a parcel of fried rice in the tree for his possum pals. Ramen Kan Japanese Noodle Bar is at Level 1, 90 Hay St Haymarket/Chinatown. Across the road from the Entertainment Centre. Phone (02) 9211 6677. 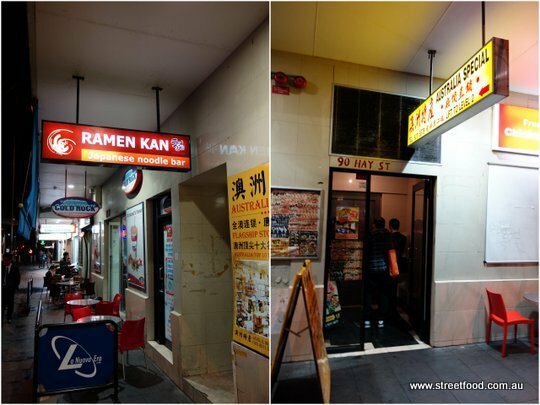 Also see one of our ye olde posts for Ramen Kan Bondi Junction. Noumea Part 1/2 ~ Snack-o-rama!